A while ago I was browsing an accessories shop. A real life accessories shop, otherwise I wouldn’t have believed my eyes: in a stack of regular, shiny bracelets was inserted a good ol’ friendship bracelet. Even though the stack looked marvelous, I didn't buy it because at the moment I thought I was over that trend. Like, a decade ago. Little did I know that those bracelets were just the tip of the iceberg. The friendship bracelets are the new item of the moment! You know, at one point I was even making friendship bracelets during holidays. In middle school, but yes. I thought it was a nice and creative pastime activity. Years later, some very talented individuals reinvent these bracelets turning them into... jewelery. There is no longer the old school look to them, these new bracelets are the epitome of chic! We are talking insertions of rhinestones, golden clasps and all kinds of assorted decorations. So I did a little internet roundup of what can be found in the online stores. Two of the best, specialized in fancy, handmade creations. And maybe, just maybe, I will head out to that accessories shop where I saw that stack of bracelets and get it so that I solve this obsession. Temporarily. 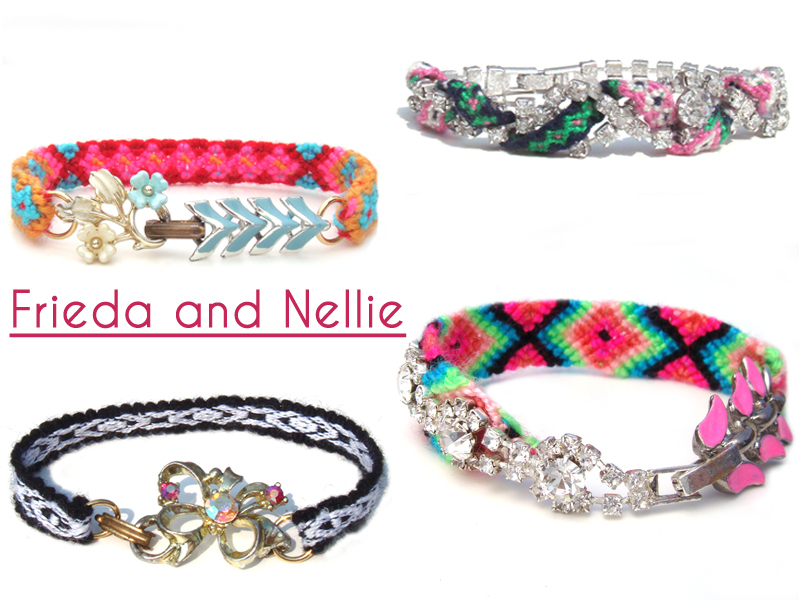 Until then, one of the most loved names for these bracelets must be Frieda and Nellie. Reportedly, the brand's founders, Stacy Herzog and Sarah Reid, recently partnered with J. Crew. I love them! Reminds me of childhood too. I live in England and these were majorly popular a little while ago. I owe one too and its quite chic! Yes, aren't these the best? Nice links, I especially love the tag-line of your blog, keep it up!